Brighton’s Leon Balogun is expecting a “more intense” upcoming match against Liverpool compared with his debut. Brighton's Leon Balogun pictured during his Premier League debut against Man United. 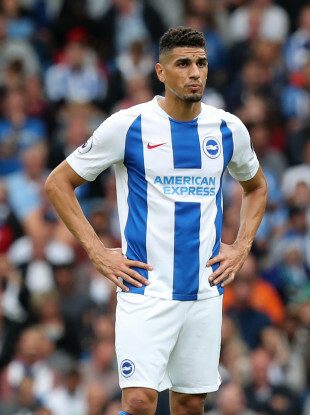 AFTER STARRING IN Brighton & Hove Albion’s surprise win over Manchester United, Leon Balogun has shifted attention to their game against Liverpool, anticipating more intensity from Jurgen Klopp’s men. The 30-year-old made his Premier League bow coming as a 20-minute substitute for Lewis Dunk to help his side claim a 3-2 win over the Reds Devils on Saturday. Set to be handed his full debut at Anfield on Saturday, the former Mainz 05 defender is anticipating a ‘completely different’ experience. “It is going to be a lot quicker and a lot more intense,” Balogun told reporters. Balogun disclosed his talks of the division’s pace with his new teammates, who also informed him about United’s exception. “But they told me this is always the kind of game you play against United,” Balogun added. Email “'They told me this is always the kind of game you play against United... They like to slow it down'”. Feedback on “'They told me this is always the kind of game you play against United... They like to slow it down'”.